An imposing South Los Angeles middle school in a dense neighborhood not far from where the LA Riots erupted 25 years ago once bustled with 2,000 students. Today only 350 students roam its hallways. Families have fled Horace Mann Middle School and its low student achievement, but LA’s largest public university thinks it can turn that around. After two years of planning, Mann has become UCLA’s second community school and will welcome its first high schoolers in August. LA Unified is urgently working to win back families, who continue to move out of Los Angeles to other districts with better schools or get on charter school lottery lists. So far the district has put most of its eggs in its high-performing alternative school models, such as magnet and pilot schools. But what parents ask for most is a high-quality school in their own neighborhood, which is also a rallying cry of teacher unions and public school defenders nationwide. And with no overarching plan for that coming from the district, UCLA has stepped in with its own experiment: “a laboratory where we are learning and sharing solutions to 21st-century educational challenges,” UCLA’s Graduate School of Education and Information Studies Dean Marcelo Suárez-Orozco said. With a mix of human capital reforms, such as rounding out the teaching force with UCLA graduate students who have expertise in key subjects, added student learning and enrichment programs in and out of classroom, and a new focus on developing a college-going culture of high expectations, UCLA is setting out to take what is, by most measures, a struggling school and drastically improve academic outcomes for all students. All of these academic and cultural changes will be supported by a governance structure rarely used in LA Unified that provides for greater flexibility and autonomy over scheduling, budgeting, professional development, assessment, and curriculum, and which teachers at Mann had to vote to approve. By a margin of 87 percent, Mann teachers signed on, signaling a professional commitment to a dramatic change. This is the first time UCLA has stepped in to improve an existing school. In 2009 it built a community school at the Robert F. Kennedy learning complex in Koreatown that now serves nearly 1,000 students in kindergarten through 12th grade, exceeding district graduation rates and achievement averages. But at Mann, UCLA is taking on a school where only about a tenth of students are proficient in English and math. 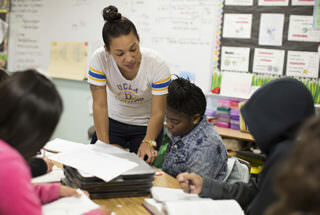 After its success at the RFK school, UCLA sought to expand its partnership with LA Unified. Rather than opening a new school from the ground up, this time UCLA leaders wanted to partner with an existing neighborhood school to help stop the pattern of enrollment decline. Mann was ripe for this kind of partnership. Its enrollment fell from 2,000 students two decades ago to 1,148 students in 2009 to 350 students this year. Previous attempts to improve the school had failed. 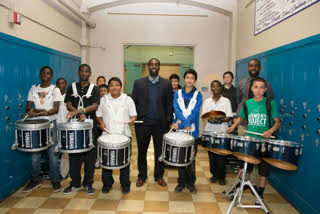 Principal Orlando Johnson with students at Horace Mann UCLA Community School. Principal Orlando Johnson came to Mann three years ago with a passion and plan to succeed. He grew up in South LA and returned to teach and lead in five schools in the area to give opportunities to students that he and his classmates didn’t have. “My professional goal is to try to figure out how to effectively educate students in lower socioeconomic areas,” he said. Soon after he took on the top job, the district chose Mann for UCLA’s next project, and Johnson said he jumped at the opportunity to partner with the university. “I felt like I had a vision for what I wanted here at Mann and I felt like with UCLA’s help they would help us achieve that visionary state a lot faster,” he said. It has taken two years of planning to develop a holistic, evidence-based plan for the school. UCLA faculty have been meeting with the school and district employees as well as parents and community members to come up with a way forward for the school that all parties can get behind. One of the first and most important decisions the planning team made was to choose an autonomous model for the school. While magnet and pilot schools are popular options, the Mann team — with the input of teachers and parents — chose to become a “local initiative school,” becoming the district’s 22nd such school. The model has less freedom than a pilot school, the model used by UCLA’s RFK school, which was part of the district’s first wall-to-wall pilot school campus. Under the local initiative school model, the Mann team was able to pick which autonomies it felt it needed from an a la carte-type menu. The school’s curriculum will be built around a model called “learn, see, do.” Common Core standards will come to life in field trips illuminating career options, in internships, and as students complete their own capstone projects. That’s similar to RFK, where every high schooler completes an internship. The design team for Mann is proposing themes for each grade level, partnering with different schools at UCLA. For example, sixth grade might have a visual and performing arts theme in partnership with the School of Art and Architecture where the students’ projects could be a graphic novel, art exhibit, or a performance. Other ideas for grade-level themes include social welfare, urban planning, law, politics, and computer science/coding. School leaders hope to replicate UCLA’s success at the RFK community school, where 99 percent of last year’s graduating class were college-ready. At Mann, UCLA’s presence is already felt. It has staffed a college center, the school’s first, filling it with T-shirts and pennants from colleges around the country. And UCLA grad students are already teaching and tutoring, giving Mann students a chance to interact with college students and see a path to higher education. UCLA faculty are involved in the school planning process. Urban education undergrads also will be tutors, and pre-law students will work with Mann students on dispute resolution. Karen Quartz, research director at UCLA’s community schools, said the partnership with the district allows UCLA undergraduate students to experience an urban school environment and allows UCLA to conduct research to inform instruction at the school. It is also a way for UCLA to increase diversity in its student population, creating a pipeline from South LA to the Westwood campus — a primary focus of UCLA and other universities in recent years. Through surveys and discussions, school leaders learned that Mann parents want more extracurricular activities and sports. Last summer, in partnership with UCLA, the school hosted an eight-week, all-day summer institute for students that included classes in Mandarin, coding, martial arts, and science plus a field trip to Big Bear — in addition to math and English classes. The students are still talking about the program, teachers said, and it is returning this summer, but only for students who will be enrolled next year, which some hope will be an incentive for students to choose Mann for ninth grade. All high school sports won’t come right away, as Mann will not be able to offer CIF-sanctioned sports at first, but they are expanding their offerings each year. Under the local initiative school model, Mann’s teachers will remain members of the UTLA teacher union, but the school has freedom from certain contract requirements like scheduling, budgeting, professional development, assessment, and curriculum. The teachers had to approve the proposal by at least 60 percent, and 20 of 23 teachers signed on. 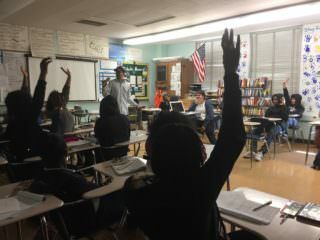 Teacher Greg Amelio’s English class. This differs from the RFK school, where the teaching force was built from scratch. RFK’s Assistant Principal Queena Kim said prospective teachers were being interviewed all over the campus as they were planning for the school to open. Johnson is also hiring new teachers, but only nine right now as the school expands with ninth grade this fall. Each year a new high school grade will launch, then in 2020 elementary grades may be added. In his three years at Mann, Johnson said he’s never started the school year with a full teaching staff. In the past, he’s had trouble even getting teachers to interview for positions. “This has not been a desirable location for teachers to come,” he said. But earlier this spring he had 15 interviews scheduled for nine positions. Eight of the positions have been filled. Johnson thinks that is directly related to the UCLA partnership. “They’re excited,” he said. Starting next year, the school will have two professional development days a week in the mornings before the start of the school day. Already this year, Mann’s teachers have begun training by faculty from UCLA’s Center X for professional teacher development out of the university’s graduate school of education. Greg Amelio, an eighth-grade English teacher and a union representative, has taught at Mann since 1999 when 2,000 students attended. “We’ve had other people come out and work with us and use our students for study,” he said of his early skepticism of the partnership. “UCLA has definitely through their constant commitment and dedication engaged with us through the process” and earned the teachers’ trust, Amelio said. Johnson has stressed it’s not a takeover but a partnership. He said UCLA is interested in finding out what the community wants rather than imposing their ideas. Johnson has 100 spots to fill for the school’s first ninth-grade class. So far about 30 students have registered. He expects about half of the eighth-grade class of 120 students will stay for ninth grade and thinks Mann’s high school program will be attractive to families who might otherwise go to a charter, private, or magnet school. Not being able to offer CIF-sanctioned sports has meant those students who dream of playing varsity football or basketball will likely opt for Crenshaw High School, Johnson said. Recruiting students is something UCLA didn’t have to deal with at RFK, as that campus was built to ease overcrowding and neighborhood families were eager to send their kids there. 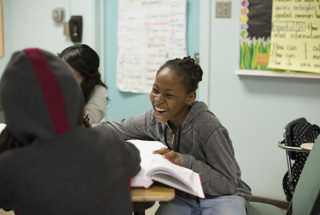 At Mann, recruiting students back to their neighborhood school is now a key task. Elijah Black will be part of Mann’s first ninth-grade class. He said some friends are already getting better grades since UCLA became involved with Mann. And it’s already improving, he said. He said some of his friends are getting better grades since UCLA became involved. “It’s still the same school, but people are getting their act together,” he said. 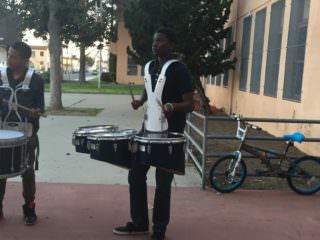 “He’s really comfortable here and I feel safe and secure with him being here,” said his mother, Teri Blackpatton, who attended a recent enrollment night where her son performed in the drumline. Other moms that evening asked if their kids stayed at Mann for high school, would they be guaranteed a spot at UCLA? “Yes, in a perfect world,” responded Carla Estes, who will lead the school’s new high school program. Johnson told the parents there was no guarantee but pointed out that 99 percent of last year’s graduating class at UCLA’s RFK school were college-ready. But just being around UCLA types is tempting for Akili Woods, a Mann eighth-grader and student body president. “I believe that even though you’re not guaranteed a spot in UCLA, my mom told me that you will know the people that can get you into UCLA,” he said. He wants to study teaching at UCLA but has yet to decide if he will stay at Mann next year. The challenges for UCLA and Mann are daunting. The neighborhood has a low median income, high rates of violent crime, and just 6 percent of residents are graduates of a four-year college. A school climate survey taken by students and staff last year shows that 52 percent of students say they don’t feel safe at the school. The student body is 49 percent black and 48 percent Latino, half are foster youth, and 30 percent require special education services — more than twice the district average. On state standardized tests last year, just 10 percent met or exceeded English standards and 12 percent met or exceeded math standards. The sprawling campus spans a city block near Florence and Western avenues, not far from the flashpoint of violence in the Rodney King riots. The aging campus, built more than 90 years ago and named after an American politician and education reformer who believed public education should be universal, used to be a pillar of the community. But the community has lost faith in the public school institution, Johnson said. Many parents send their children to schools outside the neighborhood, mainly to magnet programs and charter schools. But he maintains that parents in South LA should have high-quality options in their neighborhoods. The LA Unified- and UCLA-educated administrator has returned to his neighborhood to give kids a better shot at being prepared for college than he had. Johnson grew up in the Baldwin Hills/Crenshaw area of South Los Angeles and graduated from Dorsey High School. While he was at UCLA, Johnson realized how different many of his classmates’ high schools were with many more AP classes and enrichment opportunities. “The community you live in should not determine what type of education or what type of extracurricular activities are offered,” he said. UCLA is taking the challenge head on and will look to its success at RFK. “That’s the ambition, to create proof points of what can be done when you have organic, purposeful, democratic partnerships with our community to build a school where our kids can thrive,” said Suárez-Orosco, the UCLA dean. Since Johnson arrived at Mann in 2014, there have been improvements among black and Latino males. In 2015, 49 percent of them were passing math; last year 87 percent did. Before he came, algebra was not offered at the school. Now students can take algebra in eighth grade and are taught by a UCLA faculty member. The Mann and RFK community schools are among four other schools that the University of California system has created through partnerships with K-12 school districts statewide. UC San Diego has partnered with San Diego City Schools on two schools, Preuss School and Gompers Preparatory Academy. UC Davis has a school called West Sac Prep, and UC Berkeley has partnered with Aspire Public Schools, a charter management organization, on CAL Prep. In Los Angeles, other universities have delved into K-12 education. USC runs Hybrid High, a charter high school in downtown LA, and Loyola Marymount University partners with several district schools. UCLA’s venture is different, as it is a public university partnering with the school district to create and expand public schools. There are a few examples of these kinds of partnerships happening around the country, but the model is gaining popularity. One example is a STEM-focused high school through a partnership between Indianapolis Public Schools and Purdue University, another public university. “(It) can be challenging to figure out the role of the district and maintain real autonomy for the schools, but it offers a nice ‘third way’ to the usual district vs. charter debate,” said Robin Lake, director of the Center on Reinventing Public Education at the University of Washington. “First and foremost we are invested and engaged at this school because we want to ensure that all the students in that neighborhood have an excellent public education,” UCLA’s Quartz said about the new venture at Mann. “What the university gets is a place to advance teaching and service. “One of the benefits is the long history that the school has had in the community. It is just a cornerstone for public education in that community, and it feels like an honor and a privilege to engage with that,” she said. “What we endeavor at UCLA, the world’s great public research university, is an organic, purposeful, long-term commitment to manage and engineer pathways so that a meaningful representative sample of our city’s population has a first-class education with 21st Century skills that our economy, our society, our democracy need moving forward,” said Suárez-Orozco, the UCLA dean. He pointed to the RFK Community School where students have been accepted into universities like UCLA, UC Berkeley, and Yale.